Our wines were a 2010 Biltmore Reserve Sonoma County Chardonnay; a 2010 DeLoach “Heritage Reserve” California Pinot Noir; a 2008 Francis Coppola Petite Syrah; and a 2010 Sophia rose (by Francis Coppola). We also auditioned a 2007 LaCzar zinfandel as a new speaker-gift wine. We are going to try a case and see how well it goes over. Anything is better than what we are giving out now. Bill Irwin leaves San Diego for the last leg of his coast-t0-coast bicycle trip. We encourage you to contribute so much per mile to our Foundation in his name. Details and a form are or will be on the club web site. We donated several unused televisions to the Polinsky Center. Thanks to the Rock Bottom for giving us the televisions to donate. 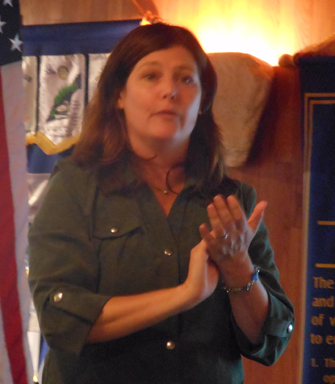 Our speaker was Jennifer Gilmore, Executive Director of Feeing America San Diego, the largest distributor of donated food in San Diego County. Since 2008, FASD has distributed more than 53 MILLION pounds of food to deserving families in San Diego. Its Sunset Soirée at the La Jolla Beach and Tennis Club on October 13 will feature performer Sheryl Crow and Master of Ceremonies, Larry King. The e Proceeds will benefit FASD’s activities. For tickets or information, call Diane Woerner at 858-452-3663, ext. 127. There will be no Pitch next week. Your diligent reporter is proving something less than diligent.